AEROFLEX insulation is made of a synthetic polymers mixed with a very large quantity of fire extinguishing and smoke reducing substances. It will not melt, does not produce flaming balls and produces a low smoke density. Most of the gases produced will be hydrocarbon and carbon dioxide which are minimally noxious when compare to hydrogen cyanide gas. The fire will extinguish by itself within a short time when the flame is suffocated or removed. 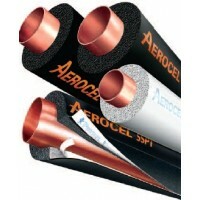 AEROFLEX closed cell tube and sheet insulation is a flexible, closed cell and lightweight elastomeric material designed for insulating liquid cooling and heating lines. It is an ideal insulation for frost control on cold water plumbing. It prevents heat gain and condensation problems on chilled water and refrigerant pipelines, and it also prevents heat loss from hot water plumbing, liquid, and dual temperature piping. Moisture Resistance - The Closed Cell Structure protects against moisture, and eliminates the need for a vapor barrier in most applications. Anti Vibration - The high elasticity of AEROFLEX insulation minimizes vibrations and resonance in chilled water and hot water pipelines during operation. AEROFLEX tubes insulate and prevent condensation when used in operating temperatures down to..
AEROFLEX closed cell sheet insulation is a flexible, closed cell and lightweight elastomeric mate..
AEROTAPE is a flexible and self-adhesive insulation foam of the same elastomeric material as..
Aeroseal is a Modified Neoprene Contact Adhesive specially formulated for bonding Aeroflex Insula..